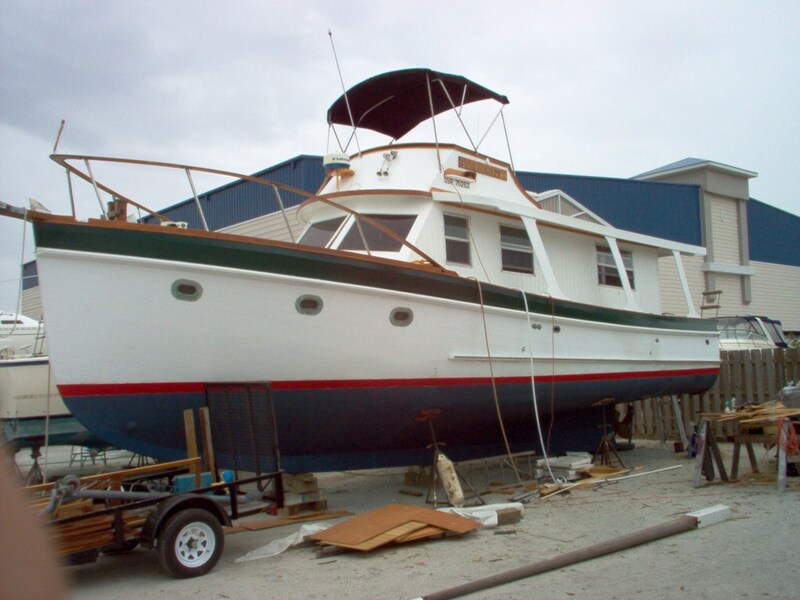 I have a 1974 Eagle 40 trawler that is a Taiwanese built trawler that I am interested in learning more about the history of these vessels and learning of any other owners of the Eagle trawlers. Here's a few pictures of mine. Hello Barry. I guess we are the only owners of an Eagle 40. Tell me a little about your's, where is she located? That dosn't look like an Eagle 40. There must be another kind of Eagle 40. This boat looks more like a Grand Banks. The Eagle 40 I've known is/was made by "Transpac" somth'in like that. They also make an Eagle 32. I like them a lot. This boat looks very different. What up? 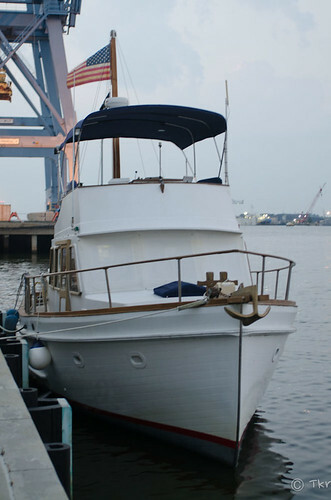 Tom Miller of Millers Yacht Sales in Toms River may have been the original importer of your boat. He is the founder of Marine Trader International and has a fully detailed scale model of the Eagle 40 in his office--It is almost 8' long and a real beauty. I remember they used to take it to boat shows in the early 70's. These boats have great lines I am pretty sure they did not make too many as Miller put his efforts into the Marine Trader line. John, you are correct, however I believe that Tom Miller was operating out of Pleasant Point when he was importing the eagle 40. The "transpac" is a completely different boat with no association to Miller's Eagle. 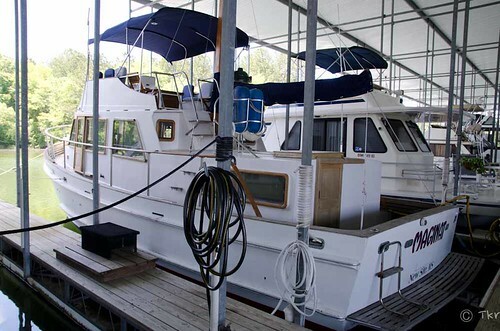 I have also seen an eagle 35 also imported by Miller which does not resemble the Eagle 40. 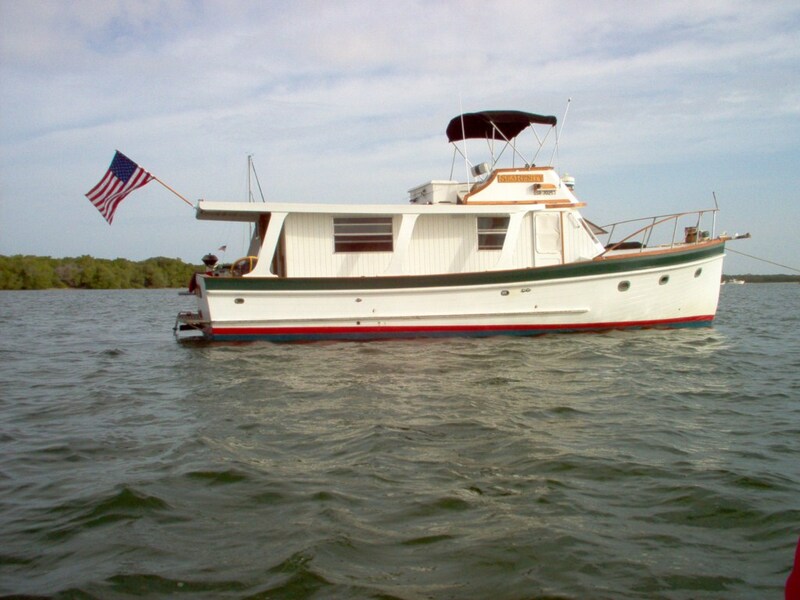 Addition I have seen a Trawler that was called a Monk 40 that looked exactly like an Eagle 40. We all must remember back then the molds were copied and Taiwan boat yards were selling boats under various labels. JohnP and Barry, thanks for your response. This is some good information that I will followup with by trying to contact Tom Miller to see if he has additional information on the Eagle 40. The lines and traditional trawler look is what attracted me to her in the first place. Capt.Jerry, Thanks for your input as well. Since the Eagle 40 looks a lot like the Monk 39 and Monk 42, it would make since that the Eagle 40 was from an Ed Monk design. I just made the trip down the Tenn-Tom Waterway to Orange Beach, AL and she used 150 gallons and that was running the generator for all but 2 nights too. Were you able to contact Tom Miller or get good information regarding the history of the Eagle 40? 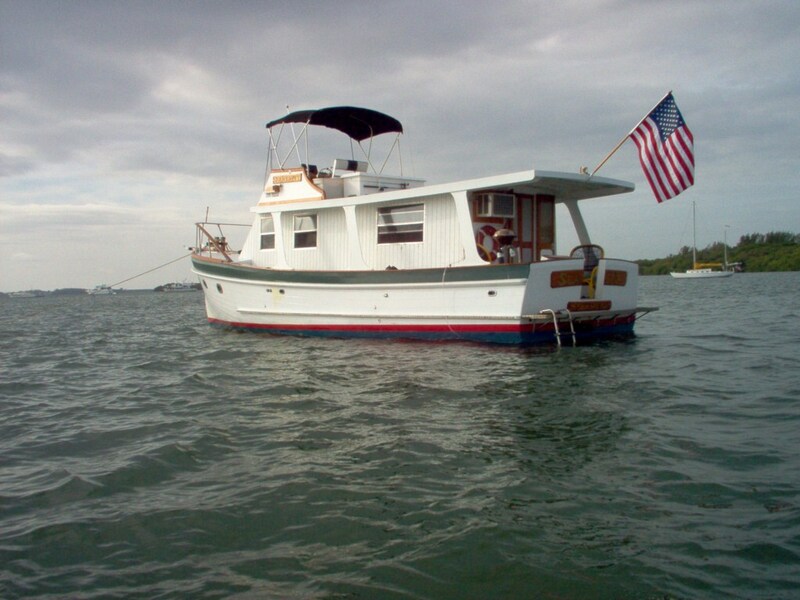 Do you know what yard built the Eagle 40? For anyone unfamiliar with them, this the Eagle 40 referred to by Eric. While not as numerous as most other production makes the owners of these pilothouse boats we have talked to absolutely love them. Barry, I sent an eMail message to the Miller Yacht Sales located on the Toms River but I have not received any response. I have not given up on trying to reach Tom yet. 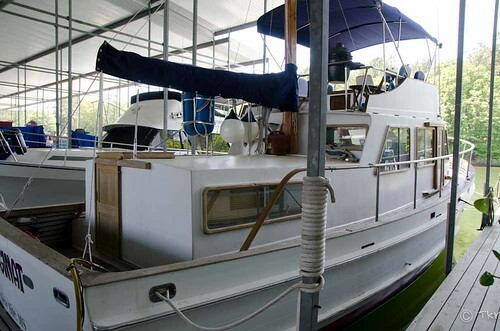 I have not found out what specific yard the Eagle 40 was built in but I am hoping that if I get in touch with Tom Miller he will be able to provide much more information. I'll post back here if I am successful. Thanks. ++looking for and Eagle 40 near me to see. 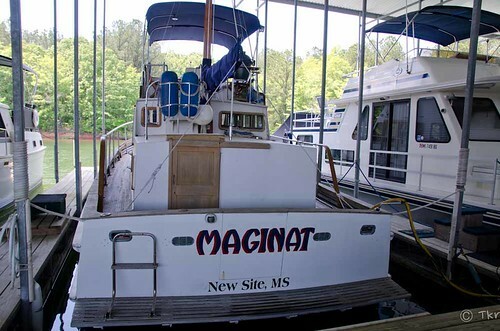 Any owner out there that would like to show off the boat? Welcome to the neighborhood. C'mon in, sit down, get a drink if you'd like and tell us about yourself. Join the conversations. Then, maybe after we get to know you, we might want to invite you into our floating homes. My wife and I have been spending Winter in the Bahamas on our Irwin 43' ketch. We are now looking for a trawler and have looked at a few. 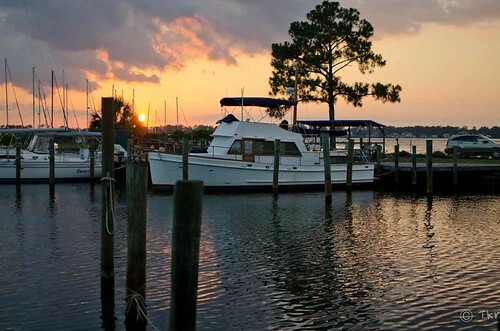 We think the Eagle 40 is the perfect trawler for us. There are a few for sale but far away and before I will travel great distance I would like to see one in person. Is there someone near me that would enjoy giving us a tour of their Eagle 40? My email is bmiller@sv-cantabile. 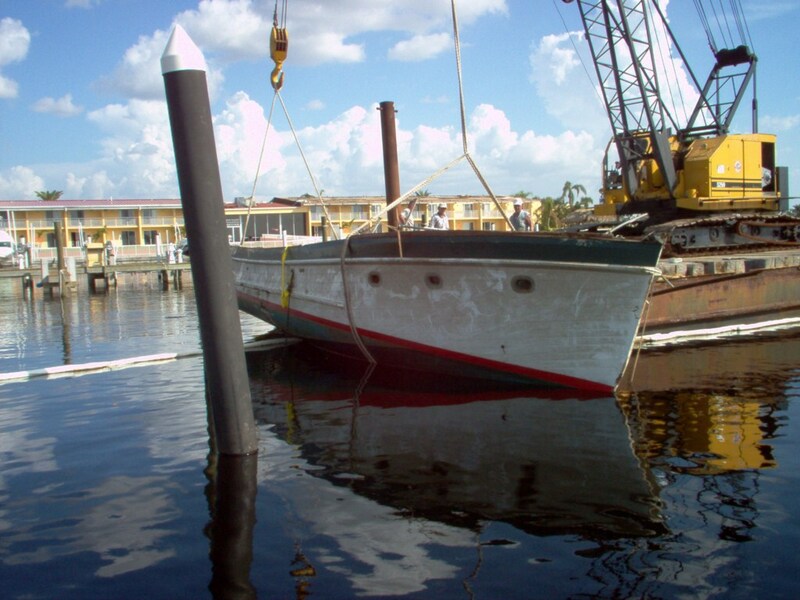 I had a 71 Eagle 40 Sedan that I found lost and lonely in a boatyard in Ruskin FL... Started work on her in 03 and splashed spring 04... Pretty much continued that she'll be my last, final, keep ferever boathome. Nice boat. Big Bedford 6 cyl diesel. Altho I always understood that they were built in Hong Kong, and yes, I believe Monk was the designer. Yup, very tender with rollers b/c of the soft chines (That's what I really like about my MT, real solid at anchor) Had the same problem with a 34 Webbers Cove that rolled like crazy! Literally danced on the hook! 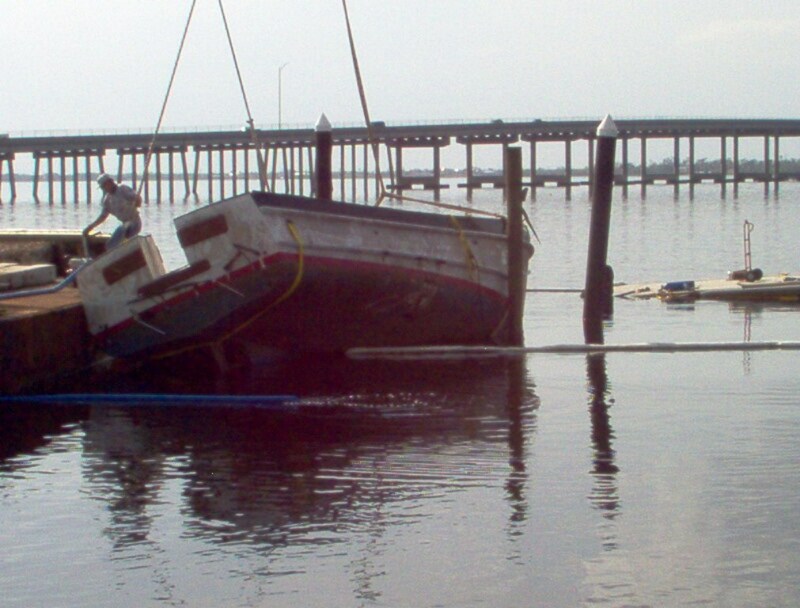 After Hurricane Charley in Punta Gorda FL Aug 13, 04... She didn't make it. Too fast, too soon.... Damn hurricanes! Keep yer bottoms wet and the spray off yer nose! Beautiful boat and nice mini story. I may have one of these boats next to me in the yard. I'm sorry to report that Don Miller, of Miller Yacht Sales locate in South Toms River,NJ passed away last November. His wife is now running the company and when I was there a month ago, the scale model of the Eagle 40 was still there. The Eagle 40 that I'm looking at is the "Europa" style. I am having second thoughts on buying it however. The boat is powered by twin Yanmar diesels. I don't know the size or model number. At this point, the asking price for the boat is $6,000. 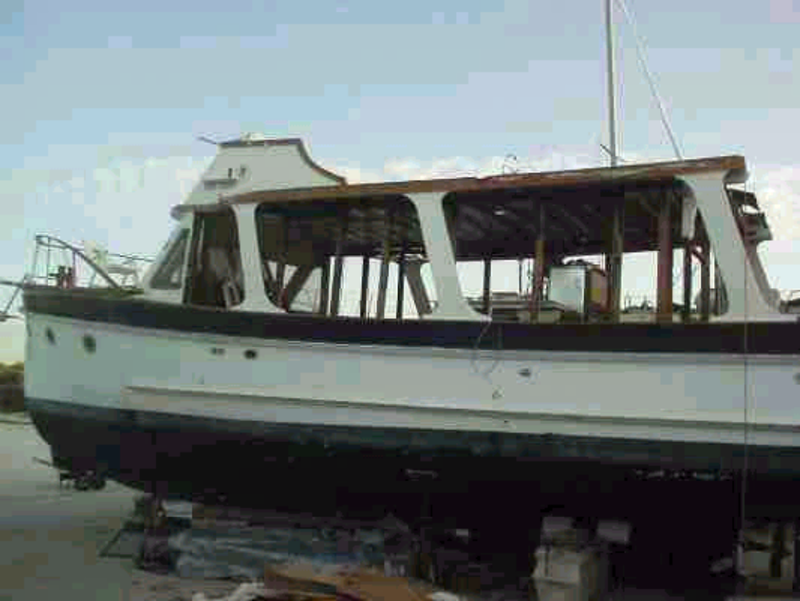 The boatyard is not willing to make any repairs to the boat nor will the adjust their price. Here are my concerns with this boat. 1. I have no idea if the engines run or not. 2. I do not know the condition of the 110V or the 12V electrical systems. 3. I don't know the condition of the plumbing system or the fuel tanks. 4. The entire trunk cabin top had a very shoddy repair done to it because of water intrusion and the fiberglass that was laid down is again showing signs of water intrusion. 5. There is rot in the walls of the trunk cabin below the sliding windows. I am thinking that I'm going to go down there with my mechanic and see if we can get the diesels working. I will change the fluids and filters prior to starting but I'm concerned about the condition of the fuel. 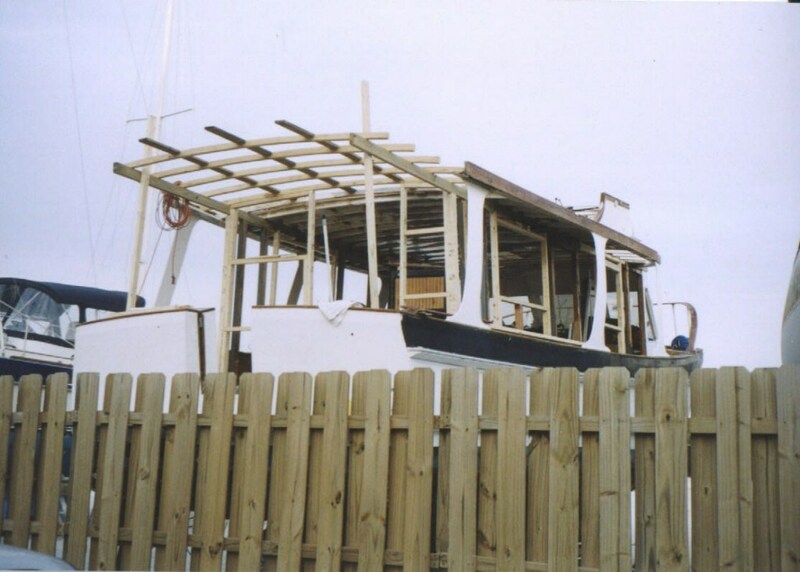 The boat has been sitting idle for about 3 years. If I can get the engines to start, we may be able to work something out but if they won't start, I think I would be out of my mind to buy a $6,000 boat with the intent of putting $60,000 worth of engines in it. I love the style of the boat and honestly I'm attracted by the price. Most of the mechanicals and electricals I can do myself but the fiberglass repair I won't touch.